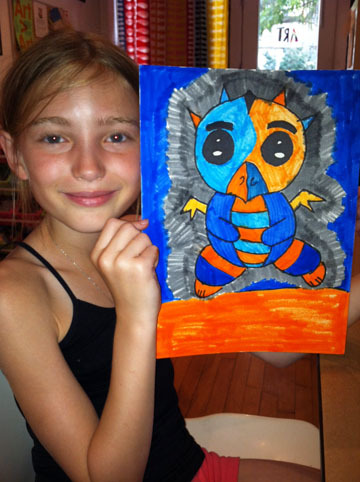 Sage uses complementary colors to create her cartoon dragon character. Summer “a la cARTe” Workshops for the week of August 6th! All workshops are $15 per participant and meet for 1 hr. (*unless otherwise noted). Please check the 2012 ART CLASS SCHEDULE for more information. Tuesday August 7th: Cartooning: Focus on Character Development (Color Pencil, Markers), 10:00 – 11:00am – 1 hr., Mutli-Age Group: 1st grade and up, teens and adults welcome. Mini-Animal Sculpture (Air Dry Clay), 11:15am – 12:15pm – 1 hr., All Ages: Children 4 and under must be accompanied by an adult, teens and adults welcome. Wednesday August 8th: *Sew Fun! 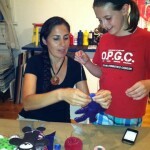 (Plush Toy Design), 10:00am – 12:00pm – 2 hr./$30, Mutli-Age Group: 3rd grade and up, teens and adults welcome. Re-Art! (Recycled Materials Sculpture), 3:30 – 4:30pm – 1 hr., Mutli-Age Group: 2nd grade and up, teens and adults welcome. Summer Collage (Paper, Fabric, Mixed Media on Canvas Board), 4:45 – 5:45pm – 1 hr., All Ages: Children 4 and under must be accompanied by an adult, teens and adults welcome. *Vinyl Toy Design (Mixed Media-Paint/Marker), 6:00 – 8:00pm – 2 hr./$30/limit 5, Mutli-Age Group: 2nd grade and up, teens and adults welcome, teens and adults welcome. Thursday August 9th: Wire Animal Sculpture, 6:00- 7:00pm – 1 hr., Mutli-Age Group: 2nd grade and up, teens and adults welcome. CANCELLED Re-Art! (Recycled Materials Sculpture), 7:15 – 8:15pm – 1 hr., All Ages: Children 4 and under must be accompanied by an adult, teens and adults welcome. 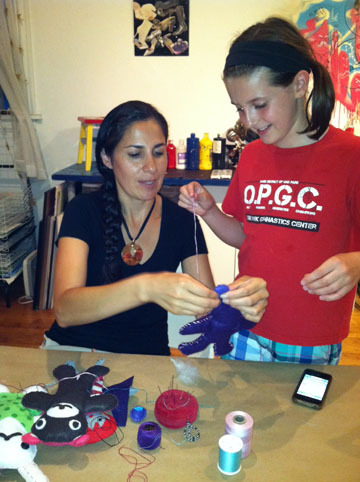 Instructor Graciela Llorente helps Claire with her plush toy. We had SEW much fun at our last workshop, we stayed for an extra 30 min.! Come join the fun in our next Sew Fun Plush Toy Design Workshop on Wednesday, August 8th, from 10:00am-12:00pm. This workshop is for participants 3rd grade and up, teens and adults welcome. 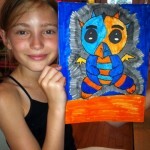 Please check under the 2012 ART CLASS SCHEDULE section of our website for more information.